Of all dovetail joints, the sliding dovetail may be the least well-known, particularly among relative newcomers to woodworking. However, the sliding dovetail may be the most versatile of all dovetail joints. It is not only very useful for connecting two pieces of stock at a right-angle, as when constructing a drawer or case but can also be used to connect the parts of assemblies such as cabinet doors or cutting boards, for attaching table legs to pedestals, for joining shelves to cabinet cases and much more. What is a Sliding Dovetail Joint? 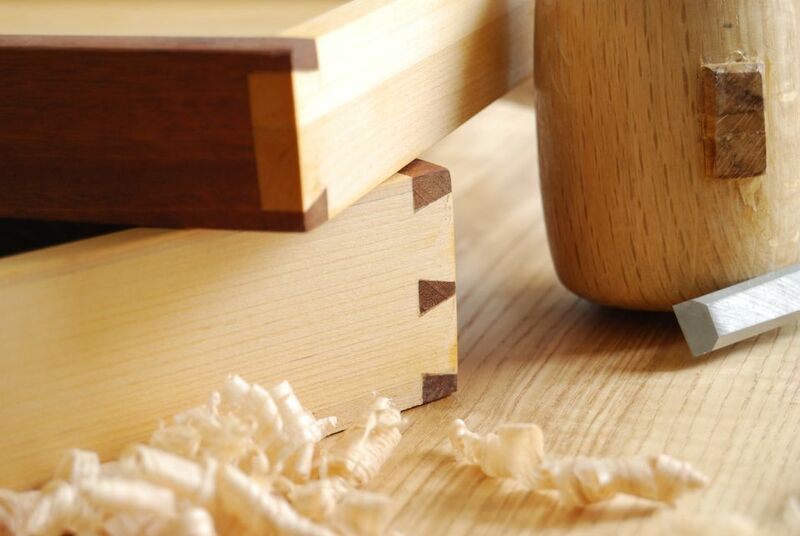 A sliding dovetail joint is made by cutting a single tail down the length of a board's edge, which is slid into a corresponding pin-shaped slot in the receiving piece of stock. In many cases, it is advisable to slightly taper the slot in the receiving piece, so that the joint is tighter towards the rear. This will make the joint easier to slide together at the beginning of assembly and more difficult at the end, but will also help to keep the joint from separating later on. Traditionally, a sliding dovetail was made by cutting the tail and slot by hand and cleaning up the components with a chisel. However, some modern dovetail jigs give you the ability to cut sliding dovetails with a router and a dovetail bit. While this may eliminate some of the mystique of the joint, it certainly makes the task much easier to replicate, in addition to being a lot quicker. If you have a dovetail jig that is able to cut a sliding dovetail joint, the steps for doing so should be clearly spelled out in the user guide that accompanied the dovetail jig.